As I am (still) emotionally recovering from the final half of the last season of Star Wars Rebels I was struck by the numerous parallels between Rebels and The Last Jedi. I feel so emotionally and intellectually overwhelmed by both these things (in a good way). I wanted to write this article for a while, but it took some time to overcome a feeling that I needed to watch them again and again because there are so many layers and nuances. I'm sure I'm still missing a lot, but I'm going to get my thoughts out here. I'd love to hear what I missed from you. As Sabine states: "It's art. Everything has a meaning." 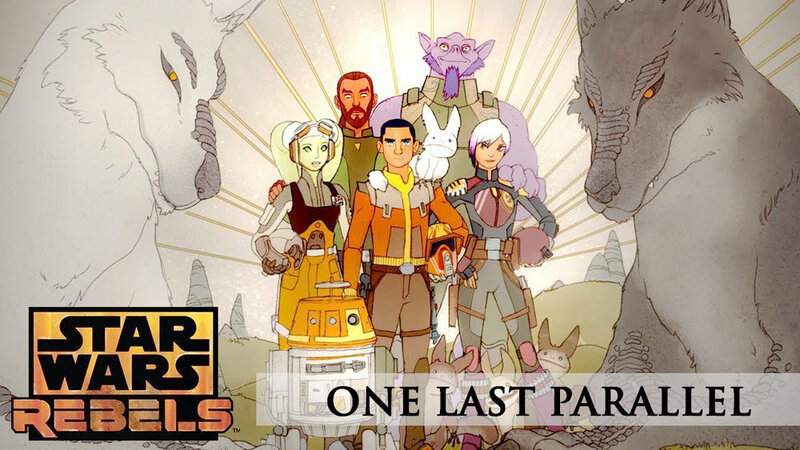 I am going to be focusing on the Star Wars Rebels season 4 episodes Kindred, Jedi Night, Dume, Wolves and a Door, The World Between Worlds, and the finale which included the episodes A Fool's Hope and Family Reunion-and Farewell. In The Last Jedi, as the movie ends, we see the Resistance trapped in a cave on Crait, unable to escape as the First Order is at the door. Poe realizes that the vulptices (crystal foxes) that had entered the mine are now nowhere to be seen. Poe leads the remaining Resistance to safety following the vulptex. In Rebels Ezra leads his small group to safety by following the Loth-Wolves. Parallel themes of sacrifice and failure can be found through Star Wars Rebels and The Last Jedi. Kanan initially sees himself has a failed Jedi, and it is through finding and training Ezra he becomes the Jedi he was meant to be. The Jedi that sacrificed his life in a heroic moment, so that his family could escape and continue the work of saving Lothal. Kanan's death served as a spark to Ezra, igniting the ultimate lesson of selflessness: the one, last, lesson. Luke Skywalker, too, views himself as a failed Jedi. Having exiled himself to an island to die, it takes Rey, Yoda, and his own reawakening in the Force to lead him to project himself to Crait, allowing the Resistance time to flee. 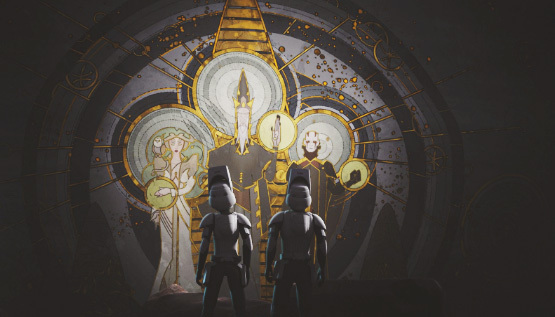 In Wolves and a Door and A World Between Worlds Ezra interacts with a piece of art that shows the Mortis Gods at the Jedi Temple on Lothal: The Father, Daughter and Son. By listening to the stone, and touching the Daughter's hand, Ezra communicates with the Temple and opens the portal to the World Between Worlds. After his time in the portal, Ezra communicates with the Son, again through the touching of hands. This evoked the image of Kylo and Rey touching hands across the galaxy in The Last Jedi. The moment the Force enables them to reach across millions of miles to physically feel the touch of the other happens in a moment of intimacy, where Rey is sharing a deeply personal moment. The significance of the touch can be seen on their faces, and The Force theme swells as their fingers meet-- again telling us that this is a moment of supreme importance. To open and close the portal for a World Between Worlds, Ezra must listen and specifically touch hands. He must also listen to and touch both the Daughter-the Light, and the Son-the Dark. He must embrace and utilize both sides of the Force. This brings to mind the image of the Prime Jedi on Ach-To as well as Luke's initial lesson to Rey about what the Force is as she meditates on the island: "Powerful Light, powerful Dark." Just as the Jedi do not have a monopoly on the Light side of the Force, so too must both Dark and Light be involved to achieve balance. This talk of balance of course brings me to the Throne Room battle, where Rey and Kylo team up and take down Snoke's Praetorian Guard. Light and Dark, blue saber and red together ignited, standing back to back and fighting together. Light. Dark. Balance. Just as Ezra had to collaborate with both Daughter and Son to accomplish his goal; so Rey and Kylo must each tap into Light and Dark to defeat Snoke and his guard. Throughout the portal journeys with the wolves and in A World Between Worlds we hear numerous voices and bits of dialogue from every era of Star Wars: prequel to sequel, and the animated shows in between. These voices not only form a chain that links all of Star Wars, their placement and order reveal other themes and significant meanings. Charlotte Errity from Skytalkers compiled a thorough list of the quotes heard throughout (link https://skytalkers.com/2018/02/27/a-world-between-worlds-quotes/) Both Rey and Kylo can be heard, as well as numerous voices from Rebels. "You chose to be a Jedi." Thrawn. While in the World Between Worlds, Ezra expresses a desire for his life to be the way it used to be, to have his parents back. Later, in Family Reunion-and Farewell, the Emperor tries to lure Ezra to the Dark Side by showing him his parents, offering him a chance to forsake his friends yet have his old life back. When Rey finally goes seeking her parents in the cave on Ach-To, she ends up seeing endless reflections of herself. When she asks to see her parents, she is shown her own image. Rey has to realize that for her, in this instance, there isn't another, there isn't any going back. And Ezra has learned the same lesson. His one last lesson, is that he must choose the selfless path, letting go of everything he fears to lose; and so he does. After rejecting Palpatine's offer of his parents, Ezra must fight off the red Imperial Guards, which visually resemble the Praetorian Guards. He defeats them by lifting and throwing rocks. And Rey helps the Resistance escape Crait by "lifting rocks." When Ezra surrenders himself to Thrawn, he leaves his lightsaber behind. Remember previously Obi-Wan has stated "This weapon is your life" and Ezra goes to this final battle without his primary weapon and defense. So too, when Luke projects himself on Crait to fight Kylo, he appears has having the blue saber, but he in fact has no weapon at all—nor does he strike out at Kylo at any time with his saber. This shows a parallel understanding of what it means to be a Jedi. As Ezra tells Thrawn "The Force is not a weapon." As the Purrgil show up and decimate the Empire's ships, Ezra tells Sabine "It's up to all of you now." The remaining Ghost family will carry on with the fight. Just as Leia tells Rey "We have everything we need." And while we fans may not feel like we don't have everything we need (I mean, where IS Ezra!?!) the stories in and of themselves have given us some answers, and even more questions; it’s a host of possibilities that I can't stop dwelling on.